Striping + Marking | A-Line Asphalt Maintenance, Inc.
A parking lot is the first thing that customers, clients and visitors see of a facility. The color contrast of fresh stripes on pavement is attractive and shows that the property owner emphasizes maintenance. Striping should direct traffic safely around the parking lot. Crosswalks, stop bars, loading zone markings and no parking fire lane will inform users where they should walk, what direction to drive and where not to park. 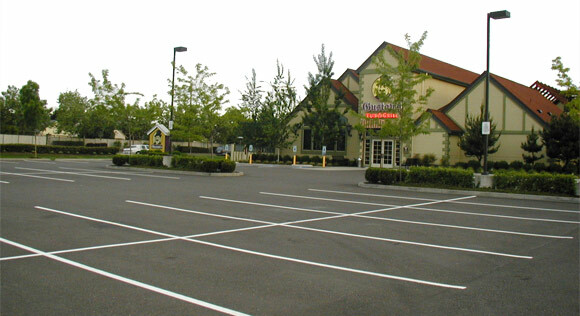 A properly striped parking lot will allow the tennant to get the most cars possible into the parking lot. Customers want parking lots that allow them to enter, park and exit quickly and safely. Attractive and properly placed parking stalls, arrows, handicap signs and other pavement stencils can provide this. The Americans with Disabilities Act (ADA) affects every property owner. Regardless of the company size, all businesses must now have the proper amount of handicap accessible parking stalls and required van access parking stalls. We can help customers avoid legal problems by restriping and reconfiguring their parking lots according to ADA guidlines.